The figure represents an image of oesophagus tissue. The right party illustrates cell segmentation. Cells are automatically categorized in two classes red and blue. The goal of categorization (named classification) is to group cells with the similar phenotypes in same class. In the proposed example, a clustering K-means algorithm is applied to cellular texture parameters. We notice that automatic algorithm groups on one side connective tissue cells in red and the other one the epithelial cells (in blue). 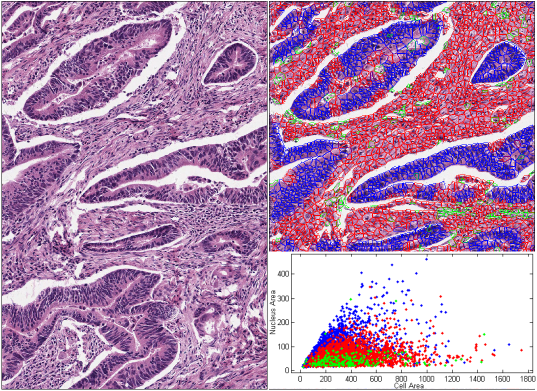 Green cells correspond to the most singular cells of the image (classification based on texture outliers). Three cell populations are shown in the scattergram representing the area of the nuclei against the cell area. Three populations are separated on this graph. This kind of approach has the advantage of being fully automatic and independent from the type of tissue. This algorithm must be implemented in a specific tool to answer customer’s needs by combining data analysis and visualization tool.